Andrew Podnieks and Fenn Publishing have already released the 2010 Stanley Cup championship commemorative book The Year of the Blackhawks. The book offers few surprises in that it uses the same layout and approaches as it does every year. Hence the fast publishing date.What you get it is a glossy, photo-filled celebration of the Chicago Blackhawks 2009-10 Stanley Cup title. It is simply a must have for any Blackhawks fan. After a 49 year drought, Chicago has again claimed hockey’s greatest prize – winning Lord Stanley’s Cup. It is the ultimate goal. It is the most recognized and sought-after trophy in sport and winning hockey’s greatest prize and hoisting the Stanley Cup in celebration is the dream of every player to ever lace up skates. In The Year of the Blackhawks, the NHL’s officially licensed Stanley Cup publication, hockey fans of all ages will enjoy an all access pass to Chicago’s Championship season. 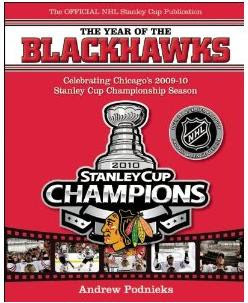 Going to press within hours of the Cup presentation, this celebratory publication features an in-depth analysis of the Blackhawks 2009-10 season. Beginning with a history of the team and a look at the Blackhawks early days, this all encompassing book is more than just a post season celebratory publication. It includes details of previous Playoff appearances, award winners, inducted Hall of Famers, retired numbers, individual trophy winners and recaps al-time drafts. It recaps the 2009-2010 regular season and provides detailed biographies of each player, as well as recounts each post season match-up and the road to the team’s ultimate Championship win. The Year of the Blackhawks contains all the stats a fan will ever want and all the game action is vividly displayed through a stunning collection of over 200 colour photographs. This book is the ultimate Chicago Blackhawk publication and the ultimate 2010 Stanley Cup Championship keepsake! If you are interested in The Year of the Blackhawks I would also recommend Hawkeytown:Chicago Blackhawks' Run for the 2010 Stanley Cup by the Chicago Tribune.